It is hot and dry. The last two months have produced record high temperatures and record low amounts of precipitation. Reduced snow pac in the mountains this winter, combined with little rain makes for some rivers only having 25% of the normal flow. Salmon usually don’t go to spawn just yet and usually wait until the rivers are the right temperature until they start upstream. People are measuring water temperatures and two or three degrees is significant. So water restrictions may be greater this year, but the long term effect on the fish population is more concerning to me(always a fisherman’s daughter). My uncles were gill-net fishermen. I also was raised on the banks of the Fraser river. Every night on tv, the weather caster comments on the number of new high temps for the day. It has been average of 30 or so a day, throughout the province. It has also been very humid. The province has nearly spent this years fire budget already and the worst of the forest fire season won’t be here until August or September. The medians along the road are so dry, one cigarette carelessly tossed has caused fires. Dry lightning is a problem throughout the province. The jet stream is pretty entrenched,so the weather will not be changing very much. There is also a red algae along the pacific coast of North amercia so now the shell fish can’t be used. 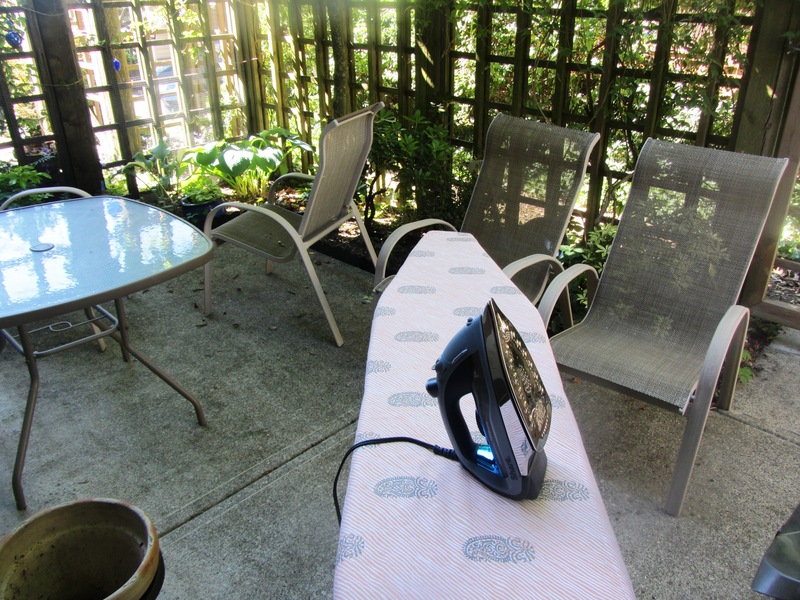 My mom used to take the ironing outside under a shady tree and the sewing machine went outside as well. I have done both but I I would rather stay in front of the fan sipping ice tea. I have been drying my clothes outside. I have been brushing up on a few skills, still need to practice but usually I dive in and have to redo. I have some ideas for sewing and when one thing isn’t working so well, I take a break and try something else. I have been thinking of travel wardrobes, light weight layering pieces without a lot of bulk. I also need to finish some bags I have been making for a few months now. Mostly that sewing has been dormant but a couple of weeks ago, I put the vinyl to the test, the piping worked a treat and have applied it to the necessary bags, I need to put in a magnet next before I do the next seam. I am still stymied with the bag handles and now know what I want but my piping for the handles is too soft, as per usual I have no idea where the vinyl tubing is. I am sure I saved it somewhere, but it will be easier to walk to the hardware store. I bought new vinyl and tried it in a handle but don’t like the finish where it joins to the bag. I have now ordered new hardware from Emmaline bag supplies. 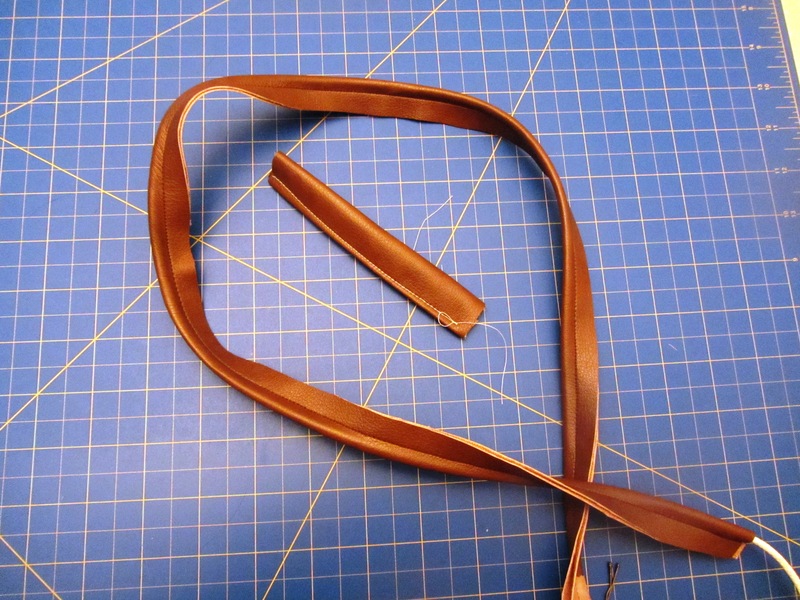 I will make straps and use rivets to attach them to the metal rings and the bag. 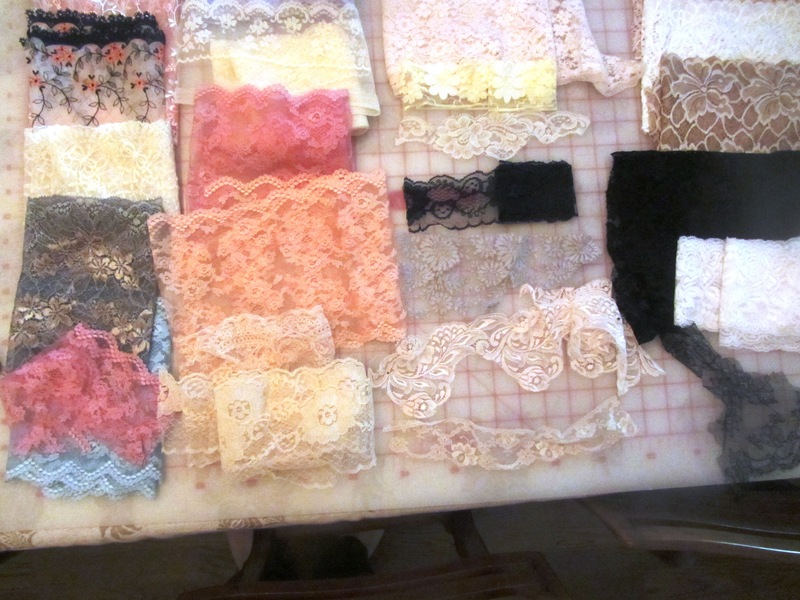 I sorted out my lace a couple of weeks ago, I think I found it all. I have been collecting for years, use a little tiny amount when I was making dolls. I bought some each time I found something interesting. Christine’s Lingerie used to be manufactured in West Vancouver and once a year she would have a big sale and that included her fabrics and laces. 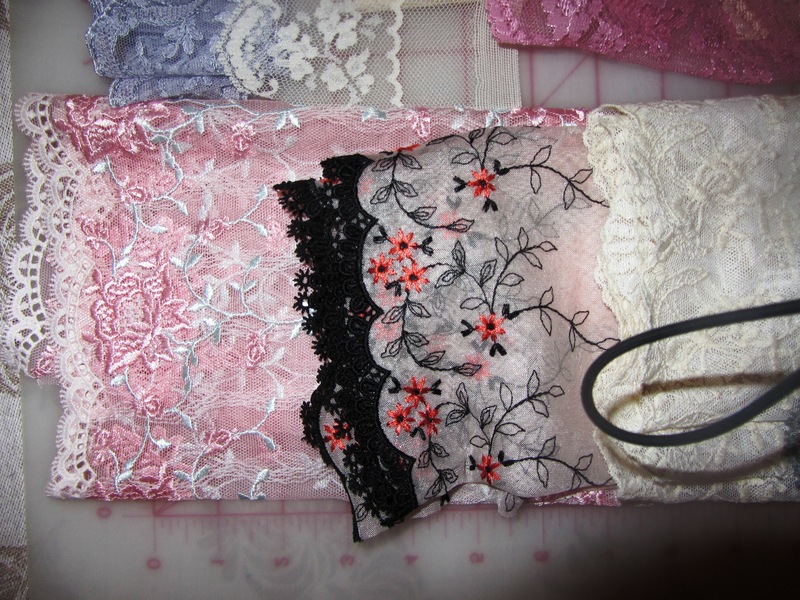 I was usually a cheapskate and would get a grab bag of lace, or silk or chiffon offcuts. Some have stretch, some is yardage, various widths, and colours. Excuse the strap from the camera in the first photo, but the pink embroidered one and the black trimmed were bought in Yalta, the sales clerk thought I should buy more, I wish I had now of course, at the time the language barrier intimidated me a bit.